Here's how to account for receiving your loan and paying it off. 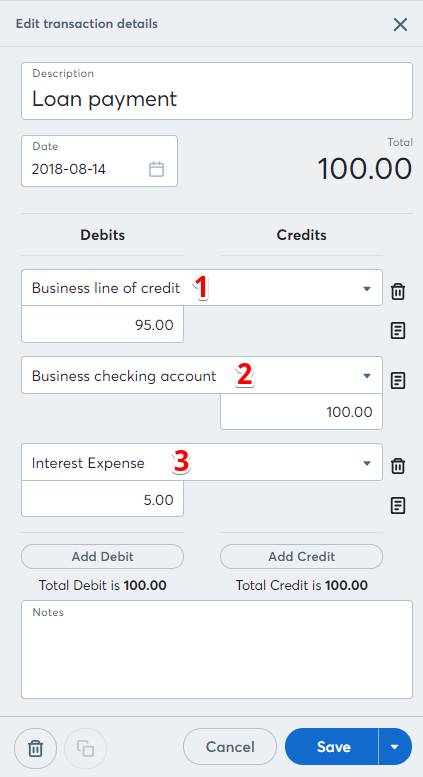 Under the Accounting tab in the left-hand navigation menu, select Chart of Accounts, then the Add an Account button. A pop-up menu will appear containing several tabs. Select Liability > Non-current liability > Long term debt > Loans. Make sure the payment account button is checked, and edit the name so that you can easily recognize the loan. Click Save. Click on the Journal Transactions tab in the top of the accounting screen. You need to create a transaction that indicates the availability of the loan funds, so you’ll debit your checking account and credit your newly created liability account with however much you have set aside for a loan. 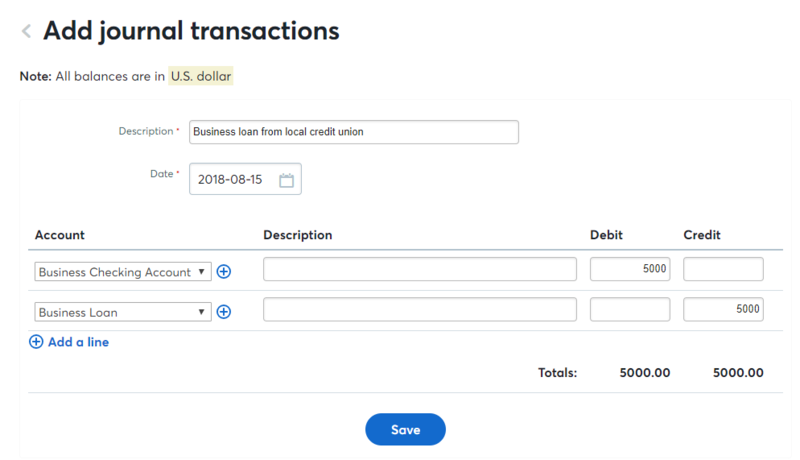 If you’ve connected your bank account to Wave, it will import the deposit transaction showing the loan funds available in your checking account. You’ve already accounted for this with the journal transaction you just created, so you can go ahead and delete the transactions when Wave imports it. You’ve accounted for your loan in Wave! Wondering how to enter journal entries with more than two lines? In the example above, you actually need three lines in your journal entry in order for it to balance. Just click Add a line (the green + sign) to add another line or lines to your journal transaction. 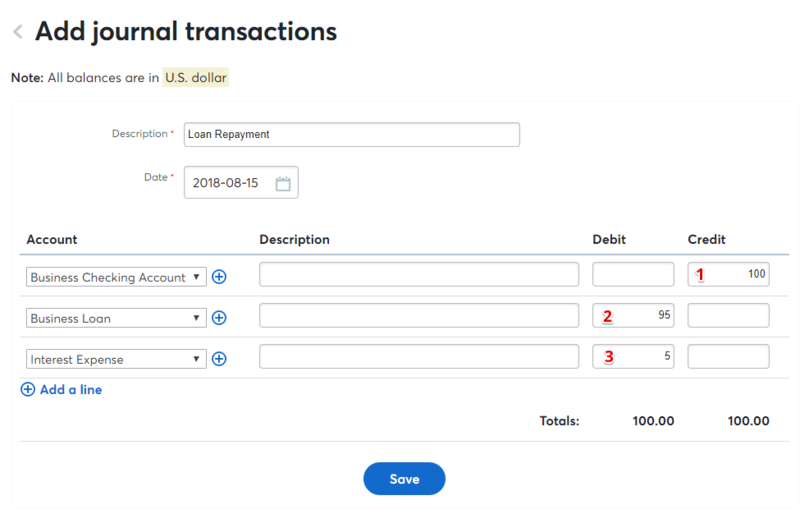 You may notice that the interest expense portion of the loan repayment journal entry doesn't appear on your Transactions page. Don't worry, it's there! You can see it in your reports. Scroll down to Liabilities & Credit Cards and select Loan & Line of Credit. Edit the name so you can easily recognize the loan. You can also edit the account currency if necessary, and include the account number. Click Save. Under Transactions, click More > Add journal transaction. You need to create a transaction that indicates the availability of the loan funds, so you’ll debit your checking account and credit your newly created liability account with however much you have set aside for a loan. Wondering how to enter journal entries with more than two lines? In the example above, you actually need three lines in your journal entry in order for it to balance. 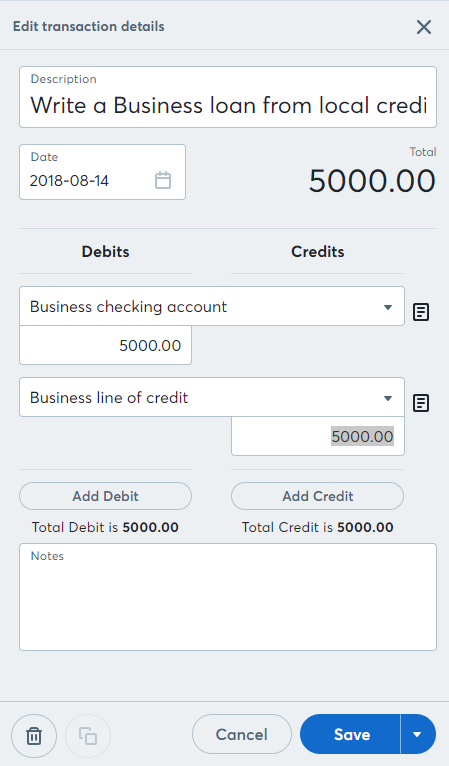 Just click Add Debit (in this case) or Add Credit to add another line or lines to your journal transaction. We hope this article gives you the basic info you need to start tracking your loan in Wave! As always, however, if you need more specific information we recommend you get in touch an accountant or bookkeeper who can provide information based on your business’s situation. The Wave Pro network connects you with accountants and bookkeepers who are familiar with Wave – you can check it out here.